WE *REALLY NEED* FOSTER HOMES! If you live in the Puget Sound area and would like to apply as an SPDR foster home, click here to send me an E-mail! To see all featured purebred dogs available Dobermans through SPDR, click here to visit Petfinder. Once you arrive at the new site, page through the list to find Dobermans! This link can be used to find all breeds (and even cats) throughout the U.S., Canada, and other locations. SPDR is dedicated to placing our dogs in qualified, permanent homes. 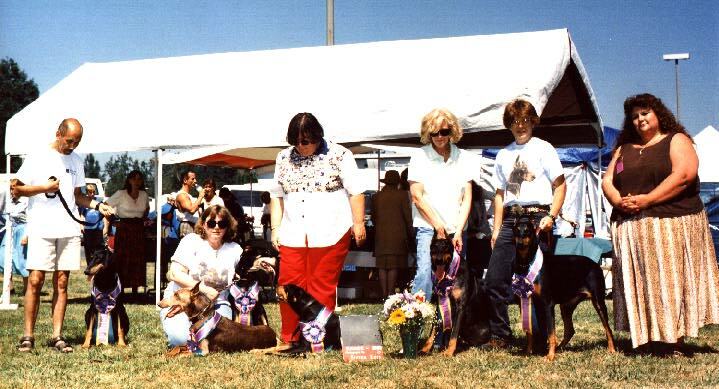 After you send your forms to SPDR, they will be mailed out to the Doberman Breed Representative and Co-Representatives. We then do our best to match you with any available dog. If we do not have a good match, you remain in our system for future available dogs. We will do our best to help you rescue a Doberman! Feel free to send me an E-mail (link below) to let me know that I'll be getting your application in the mail. "Leo" has been adopted and is doing great. He accompanies his new owners on hiking trips and in their motor home. "Alex" has officially been adopted by Nancy Phillips! "Rex" now lives with an adoptive home in Oregon! "Alexis" has been adopted by Bill Bartlett from the Doberworld list! "Zeus," the ten year old male, has found a home!!! 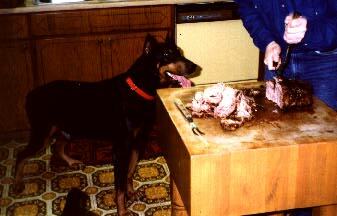 "Pup" has been adopted by a very experienced Doberman owner! "Katy" has been adopted and her new name is "Jet." See the picture and story below. Sunshine is doing well in her new home. Jet (above left) was picked up as a stray by the same shelter that picked up Buffy (below). She was not claimed by her owners, and (thanks to a tip from Cathy Mitchell) I was able to adopte her minutes before they were to put her down. 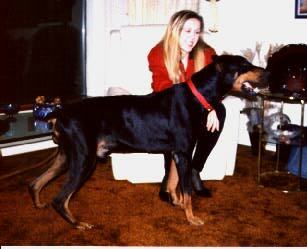 We took Jet (then "Katy") with us the day of our local specialty, and I was to meet with a woman after the show regarding placement of another rescue Doberman. My home interview went well, and I let her meet Jet, although I had really planned for her to adopt one of the other dogs. 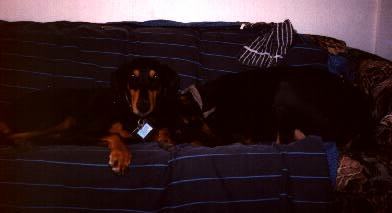 Shelley fell in love with Jet, and Jet got along fine with "Reed" (above, right), Shelley's other Doberman. The situation with the other rescue changed, and Shelley *really* wanted Jet. I had already had a tentative home for Jet, but in the mean time, we learned that she hated cats. The other home had a cat. I guess that Shelley and Jet were meant to be together. She was spayed the following week and placed with Shelley a few days later. Jet is getting along fine in her new home, and Shelley couldn't love her more. We've seen Jet a couple of times since the adoption, and she looks great. Buffy was picked up as a stray and ended up in a shelter south of Seattle. At about six months of age, she was only a couple of days away from the needle. I received a call about her situation. We were (and still are) so low on foster homes that I put out a plea for help on this page. A gentleman called almost immediately. I interviewed him over the phone and then told him about Buffy. His wife went down to see her and put a deposit on her the same day. Now she is a happy, healthy member of their family! 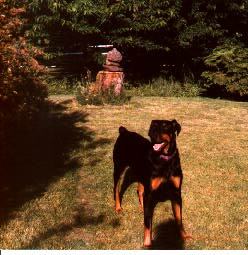 Sad News: Jake went to the Bridge on December 7, 2000. He was surrounded by those who loved him. He will be missed by many. 8/6/98: I'm happy to announce that my mother has decided that she cannot part with Jake, and she is formally adopting him! Jake could not have found a more loving home. Jake was wandering around a neighborhood for about three weeks before somebody called animal control. He was rescued from the Humane Society in poor shape. You could see every bone in his body. He needed an immediate hospital stay and treatment for dehydration and starvation. Jake is now being fostered by my mother. He has a little problem with coordination of his back legs, but he gets around just fine and he doesn't let it affect his fantastic temperament. X-rays show that he has a couple of vertebrae in his mid back that are fusing naturally. The X-rays of his neck show normal alignment. He is on medication and still recovering from his starvation experience. We will continue to treat him with medications and possibly continue acupuncture. He is steadily improving and we have every hope that he will find a loving home! I can't say enough about the temperament and attitude of this dog! He loves everybody! He gets along with the cat and seems to love children of all ages. It really make you wonder how this guy got into his position. He is the nicest Doberman that you'd ever want to know! Jake is still doing well. It is obvious that he will always have a deficit in his rear legs due the the disc problem, but he gets around fine and is managing with no obvious pain. We have established the lowest level of dexamethasone that allows Jake to function normally. We are currently weaning his steroids down while adding traditional Chinese herbs and acupuncture treatments. Our goal is to use as little steroids as possible while maintaining his quality of life. Special thanks to Jehnna Taylor and Carolyn Regnier. Their generous donations in my "Eyes of an Angel" video auction are funding this new stage of treatment. Drey was brought to Seattle Animal Control by his previous owners at about 18 months of age. The previous owners felt guilty because they were not giving him the attention that he deserved--he spent a lot of time chained outside. Drey has been placed with an experienced Doberman owner who had recently lost his dog. His new owner renamed him Worf -- all of his dogs have Star Trek names. Worf is doing very well and is best friends with a Min Pin. He has a large fenced yard to play in. Worf finally has a stable home with owners that give him plenty of love and attention! NOTE: This is an independant site. Although Jim Anable is a Doberman Pinscher breed co-representative for Seattle Purebred Dog Rescue and a member of the DPCA Rescue Committee, this site has no official affiliation with those, or any other organizations. Any comments on this site should not be attributed to anyone other than Jim Anable. If you are interested in adopting a rescue dog, or if you can foster or otherwise help the rescue effort, please write to me!